Symbaloo is a visual, social bookmarking tool that makes it easy to access your personal knowledge management tools. When you register to use Symbaloo, you gain access to a slick user interface that allows you to create webmixes of your favorite Web sites. The Symbaloo interface looks a bit like a high-tech Scrabble board with movable “tiles” on it. These tiles give you access to Web pages or other webmixes. The Symbaloo folks have kindly provided a number of tiles to get you started, giving you access to YouTube, Flickr, Google, Wikipedia, Craigslist, and even the Yellow Pages. They’ve also provided tabs of webmixes that you might find useful, including news tabs (news highlights and major news) and tech tabs. But you’re not limited to these resources, you can easily create or edit tiles, create your own webmixes, and/or search for webmixes already created. When you view a webmix, you’ll see a centerbox in the middle of the page. The centerbox is functional but what it can do will depend on which widget tile you’ve clicked on to access it. You can identify a widget tile by looking for an icon on the upper left corner of the tile (a magnifying glass or gears). The tour widget is specialized. 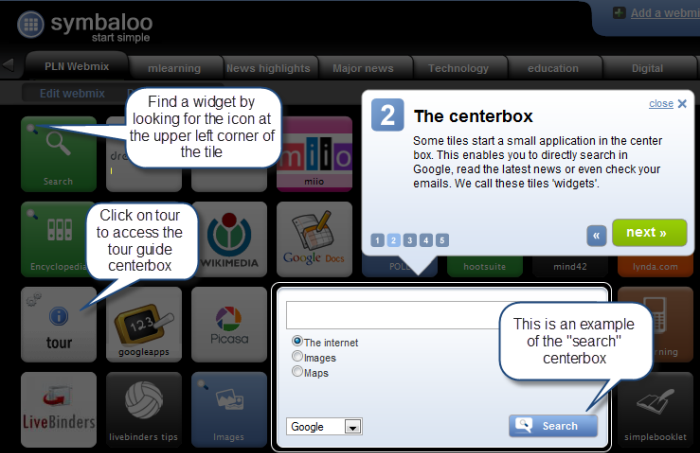 While the application starts off in the centerbox, it moves around the interface to point out features related to Symbaloo each time you click “Next.” The illustration below shows how the tour widget provides information about the centerbox itself as part of the tour. You can personalize tiles that link to your favorite Web sites to create visual cues that are meaningful to you. You can choose tile color and the image that appears on a tile by selecting from icons that Symbaloo provides or by uploading your own image. This video provides more information on creating and editing tiles. This will display a screen that gives you the option of searching the gallery or creating a new webmix. You’ll also be given the option to search existing webmixes when you add or create a new tile. The gallery view allows you to preview webmixes before adding them to your Symbaloo dashboard. You can also filter the webmixes you search by popularity, type (tiles, RSS, or news), and country. If you create a webmix, you can make it private or share it with the larger Symbaloo community. You can share with the public or with a select group of individuals (via email). 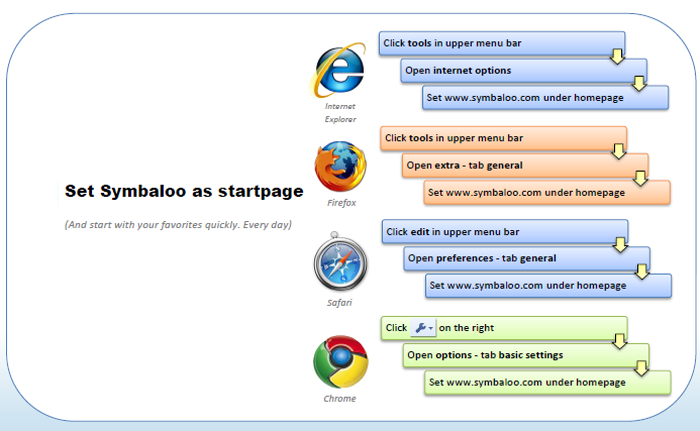 Because Symbaloo is web-based, you can access your favorite webmixes from different computers. You also can make Symbaloo your start page on any given computer. Because you can link to an infinite variety of web pages and you can embed media (images, videos, and Slideshare presentations) in a tile, as an instructor, you can make a webmix quite interactive. For example, you can create tiles that link to challenges, quiz questions, polls, discussion forums, chat pages, and other types of content and media that will facilitate more student involvement and creativity. You can provide a tile linking to a web page describing a number of exploratory activities a student will need to engage in, but make the path for accomplishing these activities (e.g., the numbers and types of tiles used) up to the student. Symbaloo has created a version of the platform specifically for educators (Symbaloo EDU). For more information about Symbaloo EDU, visit the site and investigate the different plans offered. Registering to use Symbaloo EDU allows you to connect with other educators via the forum to share webmixes and ideas for using Symbaloo as part of a learning experience. For more information about Symbaloo, you can also check out this ﻿user guide﻿. Finally, to keep up with changes in Symbaloo, visit the Symbaloo blog. This entry was posted in instructional design approaches, learning environments, personal learning environment, PLN and tagged bookmarking tool, cluster web sites, pbl, personal knowledge management, personal learning environment, personal learning network, PKM, PLE, PLENK, PLK, problem-based learning, pull learning, social bookmarking, social bookmarks, Symbaloo, Symbaloo EDU, Symbaloo start page, Symbaloo user guide, webmixes. Bookmark the permalink. Hi, guys! I’ve got to tell you this tool is awesomely GREAT!!! My experience has been incredible and I’m recommending it to everybody (Profs and Students), I work at the University of Puerto Rico. I’m going to share 2 of my favorite mixes, I have created 11. Thank you so much for your kind words and also to Dianne for helping to spread the word about Symbaloo with this blogpost. 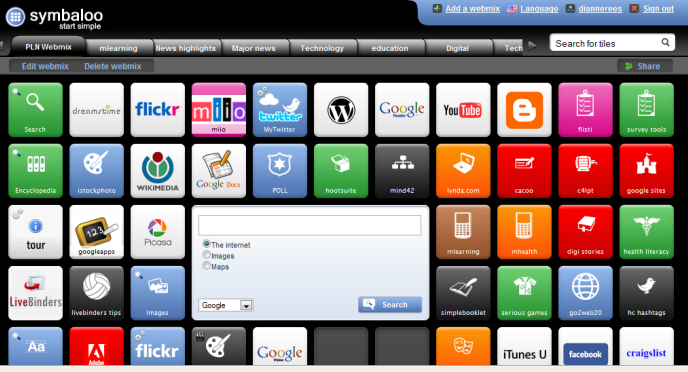 Santia your webmixes are great and love hearing that you enjoy Symbaloo! If you ever have any questions or issues please feel free to contact me kimmie[at]symbaloo[dot]com. Hi Santia, the tools2 webmix is quite cool and I loved the idea of creating a mix of infographics. Thanks for sharing these! Hi Kimmie, You’re welcome. I’m quite addicted now.